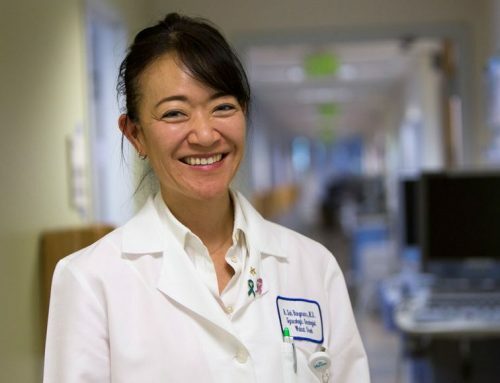 When dermatologists had the opportunity to look at well-photographed skin lesions, they identified nearly 10 percent more cancers with nearly 40 percent fewer referrals to the dermatology department, according to a large new Kaiser Permanente study of “teledermatology” workflows published Feb. 7 online in the Journal of the American Academy of Dermatology (JAAD). The study, “Comparative effectiveness study of face-to-face and teledermatology workflows for diagnosing skin cancer,” included nearly 60,000 adult members of Kaiser Permanente’s Northern California region who asked their primary care physician to take a look at a worrying skin lesion (an abnormal lump, bump, ulcer, sore or colored area) during the first half of 2017. “We reviewed these dermatology workflows and analyzed a very large number of cases using natural language processing in Kaiser Permanente’s electronic health records to match skin-related diagnoses with how they were identified,” said senior author Lisa J. Herrinton, PhD, research scientist with the Kaiser Permanente Northern California Division of Research. 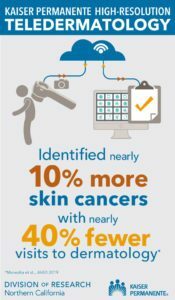 When dermatologists looked at photos of skin lesions first via the most effective teledermatology workflow (teledermatology with dermoscopy plus a face-to-face follow-up visit when indicated), they were 9 percent more likely to diagnose skin cancers and 4 percent less likely to do a biopsy, than when people were referred directly for a face-to-face visit in the dermatology department without an initial photograph; this workflow also required 39 percent fewer face-to-face visits in the dermatology department. Some of the pictures reviewed in the study were taken with a dermatoscope, a strong magnifying glass coupled with a bright light that can be optimized to look at the surface of the skin or the layers underneath. The dermatoscope can be attached to a digital camera to take high-resolution pictures of skin lesions. Then the photos are transmitted via Kaiser Permanente’s integrated electronic health record to an on-call dermatologist, who views the images on a large screen. While there are many different kinds of non-cancerous (benign) skin lesions, the most common cancerous (malignant) lesions are basal cell carcinoma, squamous cell carcinoma and melanoma. 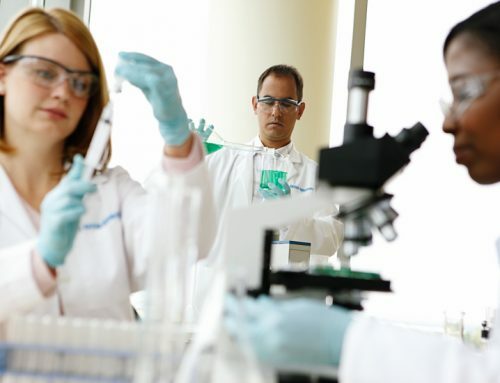 The researchers noted that due to chronic nationwide shortages of dermatologists, new strategies are needed to ensure that people receive prompt care and treatment of skin concerns. 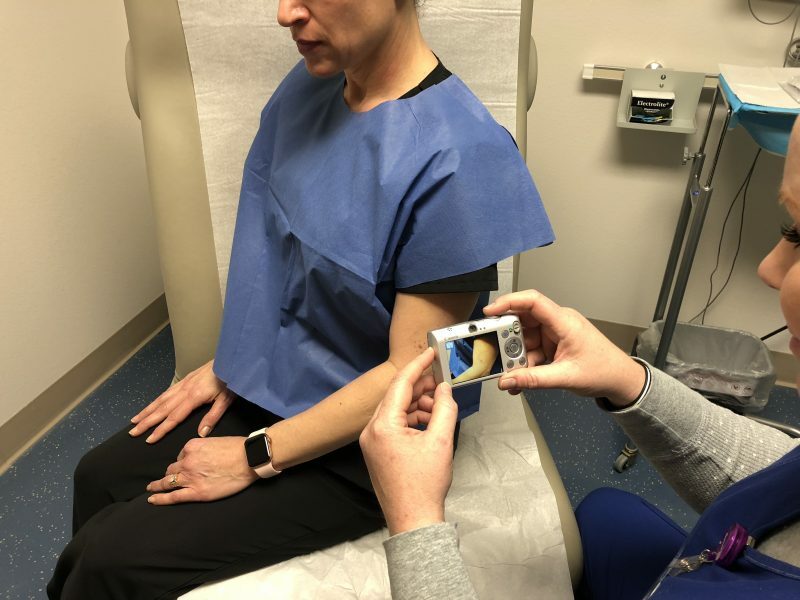 “We are sharing what we learned with the entire medical community so that there might be a better understanding of how teledermatology can be organized, to help make the U.S. health care system more effective, more affordable and more accessible,” Herrinton said. In addition to Dr. Marwaha and Herrinton, co-authors of the study were Helene B. Fevrier, MSPH, Stacey Alexeeff, PhD, Eileen Crowley, MD, Michael Haiman, MD, Ngoc Pham, MD, Melanie Tuerk, MD, Danny Wukda, and Michael Hartmann, all affiliated with Kaiser Permanente Northern California.